Two programs available: Basic and Deluxe click here to learn more. A 4-step program that controls seasonal insects and disease, while promoting healthy, strong growth and circulation. In heavy clay soils grass roots need air space to function. With core aeration we poke holes into your soil and pull the cores out (these cores are called plugs); this immediately sends oxygen to the roots. Core Aeration is particularly good for lawns with heavy thatch problems; it loosens the soil to let nutrients work down to the grass roots. In addition, it helps make the best use of watering because it prevents less runoff. 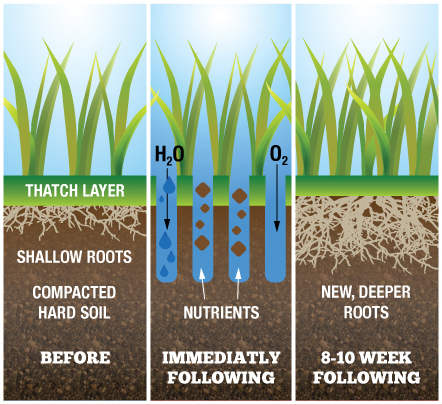 Once we achieve a balanced soil, the need for core aeration should be less. The plugs pulled from the soil also provide nutrients as it decomposes back into the lawn. We have found that by doing core aeration on heavily compacted soil, it helped open the lawn to receive more benefit from fertilizers and watering. A combination of liquid and core aeration performed at different times of the year proved to be the most beneficial. Liming raises the soil pH so that grass plants can more efficiently extract nutrients from the soil. Getting a soils pH right, means grass plants that are greener, and better able to withstand the ravages of disease, insects, and drought. Grubs eat the roots of grass plants and can do extensive damage in August and September. Grub control will lower the population of grubs to an acceptable level. The most cost effective way to establish a new lawn at a reasonable cost. Your lawn is aerated and slice seeded with our premium blend of the best grasses. Our renovation service is better than sod and much more affordable too! Our Soil Builder service is a humate formulation (Humic Acid) for the turf. Humates contain their own form of microbes that assist in transferring and releasing nutrients that are trapped in the soil. There are numerous benefits from adding humic acid to the soil, such as greater water holding capacity for the soil and it improves the utilization and efficacy of fertilizer. Outdoor perimeter spray of your home will treat the foundation to a height of two to three feet. This area can harbor a lot of pests that can gain entrance to your home. This service will control up to 30 different pests for up to six weeks. A soil test is necessary to make sure your lawn is getting what it needs, and it helps us provide quality custom care for your lawn.